In which I release some pent-up feelings. I wasted 127 minutes of my life last night. It seemed like a good idea – he was hot, experienced and promised “a grand, epic adventure.” Unfortunately, Jason Statham (Transporter) reached an embarrassing low in a movie that can only be described as “abysmal.” Unless you enjoy torturing yourself with bad cinematography, cliched plot, incoherent flow, anachronistic script writing and a fair dose of bad acting, avoid In the Name of the King: A Dungeon Siege Tale. If you happened to be eavesdropping outside my house last night, you would have thought I was watching a comedy, not a fantasy adventure movie. This movie made me laugh – hysterical, incredulous laughter that erupted at all the wrong times. The death and grief scenes were especially humourous, containing an incomparable mixture of tasteless acting, cliche and melodrama. The villain bore a remarkable resemblance to Bob Hope and his greasy, slicked-back hair seemed dreadfully inappropriate in light of his medieval surroundings. 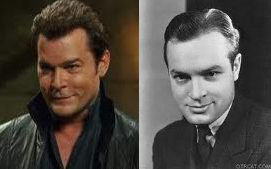 Actor Ray Liotta = Bob Hope? Also horrendously inappropriate was the dialogue. It was like Sir Gawaine saying to Sir Pellinore, “Yo dude, did you see like when I totally owned that giant?” To which Sir Pellinore replies, “Yeah man, you like totally rock. We should hang out more.” Seriously, sucky writers should stick to modern stories, where we can laugh at them without feeling sick. The storyline was the same as…every other hero movie. It was only set apart from the competition by the incredible lack of depth. Every scene had a point that could be guessed at least 5 minutes before it actually arrived. Do not be deceived, as I was…there is in fact no “twist.” What you think will happen does actually happen, though the acting may be worse than you expect. If only the director had foregone the “storyline” and stuck with a montage of Statham fighting monsters and exuding awesomeness. His well-acted character was like a chocolate chip in a vegan raisin cookie – good, but not good enough to save the rest of the cookie. Much of this movie looked like the unedited footage you expect to see in the extras. You know, the deleted scenes where the villain gurgles a few more times before he dies and the father-figure offers a lecture that is both pithy and incredibly boring. I do not know who the editor was, but I think he spent more time playing solitare and napping then working on the film. The lighting was dreadful and there was absolutely no “flow” to the first hour. I felt disoriented, confused and bored, like riding the kiddy rollercoaster at a traveling carnival with my eyes closed. I feel a lot better now…having dissed this movie almost as severely as it deserves, I will never think about it again. If, on the off chance that you have watched this movie and enjoyed it, please comment on this blog, leaving the titles of any other movies you have previously enjoyed. This will save me considerable time, disappointment and frustration in the future.